Microsoft on Friday released Windows 10 build 14328 for PC and mobile to Windows Insiders participating in the Fast ring. As Gabe Aul, Corporate Vice President of the Engineering Systems Team at Microsoft writes, this is a major build that’s packed with new features and improvements including an updated Start experience, Windows Ink, Windows Hello authentication and more. Sound familiar? It should, considering it’s more or less what Microsoft plans to deliver to the masses with its Anniversary Update this summer. Windows Ink is without a doubt the flagship feature in the new build, allowing users to write on their device just as they would paper. Through the Windows Ink Workshop, you’ll be able to make annotations, create sticky notes, draw on a whiteboard and more. With Windows Ink, Microsoft is essentially designating the stylus at a true, integral part of the Windows experience. 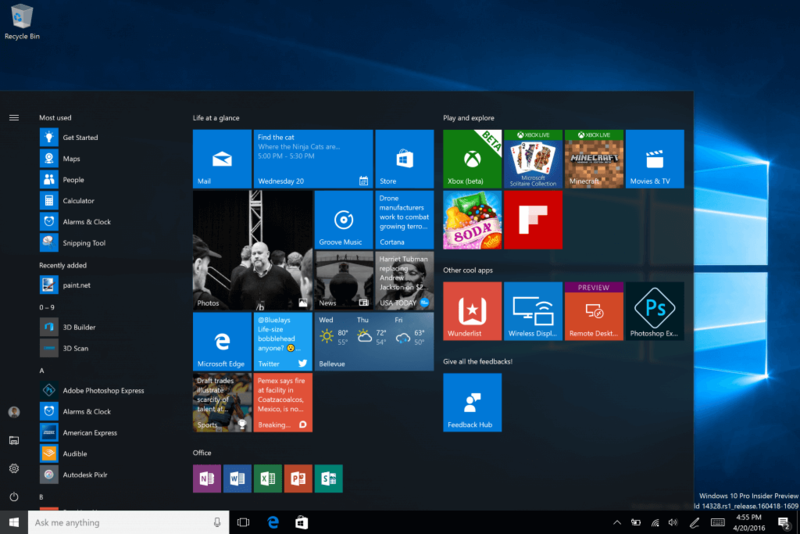 The updated Start menu is said to improve efficiency and discoverability of finding apps and is more consistent across PC, tablet and mobile platforms. Microsoft has merged the most used apps list and the All apps list into a single view and elevated it to the top level of the UI which ultimately reduces clicking and scrolling. Important functions like Power, Settings and File Explorer have also been moved so they’re always visible in the left rail of the Start menu. The Recently added section, meanwhile, now shows three entries instead of one and any additional folders you’ve added to Start will automatically appear without having to open the hamburger button. Microsoft has also made changes to tablet mode, added Cortana to the Lock screen, made it easier to use and improved its capabilities, bolstered the Action Center, updated the taskbar and more. Aul concedes that there are going to be some rough edges given the amount of code change in the build. Insiders looking for a bit more stability might consider switching to the Slow ring, he added. Those interested in joining Microsoft’s Windows Insider program can do so by clicking here. Participation is free and it grants you early access to upcoming versions of Windows 10, allowing you to get a jump on new features before they go mainstream.